Italian fashion house Moschino has announced the launch of its spring/summer 2016 capsule collection exclusively at Harvey Nichols. Full of road traffic references urging us to ‘Shop', Jeremy Scott also introduces an element of car-wash couture with window cleaning iPhone cases. 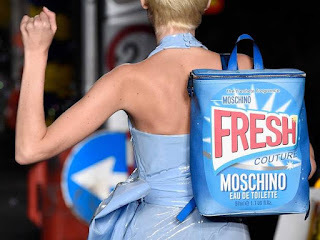 The collection comprises Moschino Shop t-shirt (£155), Shop top (£610), Fresh iPhone case (£55), Shop clutch (£320), Moschino Shop earrings (£140), Fresh t-shirt (£230), Shop dress (£765) and Shop bag (£595). Harvey Nichols will be carrying the Moschino spring/summer 2016 capsule collection in-store at Knightsbridge from today and online at harveynichols.com from September 27th 2015.